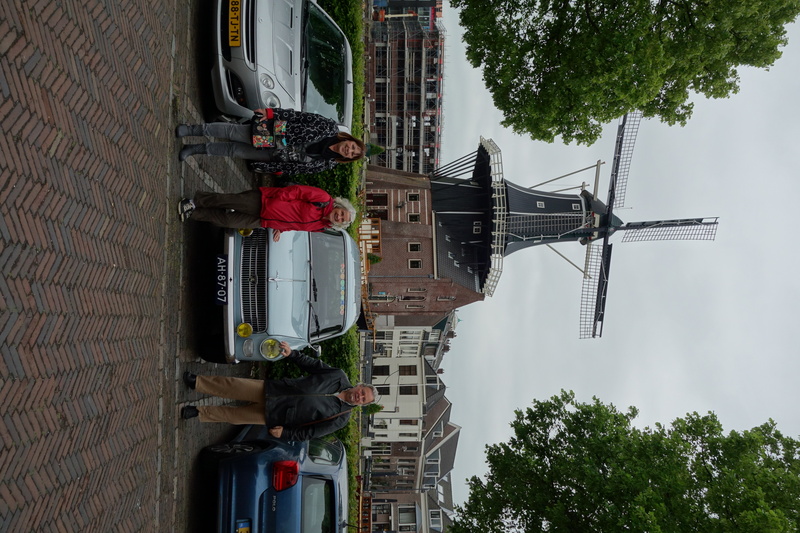 Hein, our host, took us on a great drive today, we headed to Haarlem but took the scenic route passing lakes, old villages, canals and inevitably some windmills. Today’s windmills were the traditional type used for pumping water from the low lying areas rather than the enormous modern electricity generating ones which are very common here. We checked the weather forecast before leaving and found that a wind warning was in force and by the time we got to Haarlem it was blowing a gale but we managed a good look around the town which may have the most interesting town square in Holland. The square has a large old church at one end and a grand very old Stadhuis (town hall). We had lunch in a very grand cafe facing the square and I had croquettes (very traditionally Dutch) while making a small sketch. It was fun watching people outside being blown along or struggling to make their bikes move into the wind. Children were leaning into the wind. On the way back we followed a similar route to the first day of my bike trip three years ago, but in reverse. We visited a beach, saw some dunes, travelled through Hillegom where I had lunched on the earlier trip and had a great drive. Love the photo of Paulette, and friends Jenny and Hein, and with the backdrop of the windmill and buildings. With local knowledge, you will have some great material to work on for your future paintings.